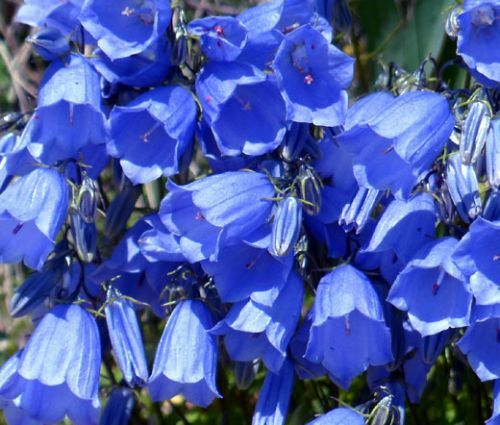 Canterbury Bells Blue Campanula Medium is a hardy, attractive biennial or annual bellflower. Canterbury Bells Blue seeds can be sown directly outdoors, and they germinate fast. Campanula Medium grows upright and reaches up to 3 feet in height producing very large, showy bell-shaped, double blue flowers on a top of strong tall stems. Blooming Canterbury Bells add a lot of color to the garden in late spring and early summer. Canterbury Bells Blue is an old-time English cottage garden favorite and a great border and bedding plant. Campanula Medium seeds needs light to germinate, so they have to be just distributed on the soil surface without covering. Blue Canterbury Bells grow well in full sun and require well-drained soil. The moist soil and cool weather with low humidity are preferable conditions for Campanula Medium. Canterbury Bells have strong stems that make this plant a superb cut flower Campanula Medium self-sows itself freely.